Do you want to know which of your traffic sources are generating the most eCommerce sales and revenue? The easiest way to find out is by enabling eCommerce tracking in Google Analytics. In this article, we’ll show you how to find your most profitable traffic source using Google Analytics. Why Find the Most Profitable Traffic Source in Google Analytics? Determining how well your campaigns are performing in terms of generating revenue. Easily comparing the performance of different traffic channels, like social media, organic search, ad campaigns, affiliates, and referral traffic in Google Analytics. It’ll give you insights on which traffic sources you should focus on to further improve your revenue. 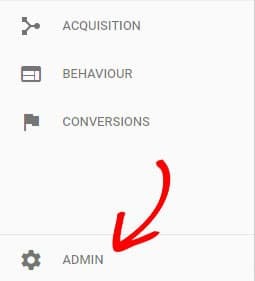 To start tracking your sales data, the first thing you need to do is install MonsterInsights and connect Google Analytics to it. Then, you’ll have to install the eCommerce addon on your site. If you need help, check our post on how to install and activate the eCommerce addon. 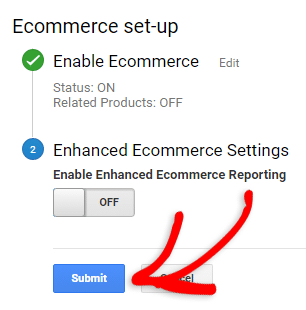 Then, you’ll need to enable eCommerce tracking on your Google Analytics account. For this, log in o Google Analytics and select the website in which you want to enable eCommerce tracking for. Now, click Ecommerce Settings under the column on the right. If you want, you can even enable Enhanced eCommerce reporting. Then, click the Submit button. That’s it. The setup process is complete. Using Google Analytics has never been as easy as it is with MonsterInsights. In the old days, you had to browse the entire Analytics dashboard to find specific data in Google Analytics. Thankfully, MonsterInsights has made it painless for anyone to set up and view advanced website data in Google Analytics. It allows you to see all of your most significant website metrics right in your WordPress dashboard, without having to navigate away from your site. 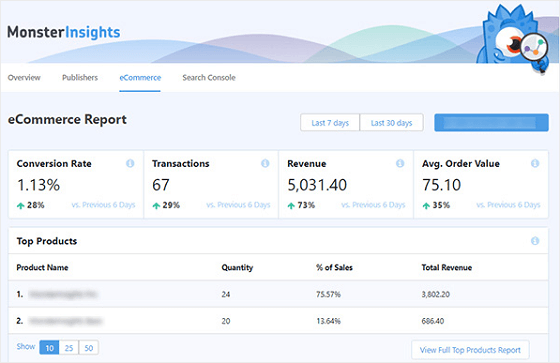 To view the top sources of your revenue, visit Insights » Reports from your WordPress dashboard and then click the eCommerce tab. Now you can see all your important eCommerce reports in beautiful, easy-to-understand tables. At the top, you’ll see your store’s overall conversion rates, transactions, total revenue, etc. Just below that, you’ll see your store’s top conversion sources, i.e. the sources that generate the most revenue. The report includes the number of total visits, the conversion rate, and the total revenue amount generated by each link. It’ll show you the top 10 most profitable sources, but you can view more by clicking the Top Conversion Sources Report link at the bottom of the report. 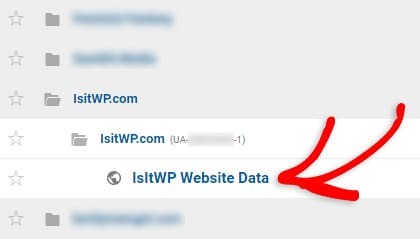 This’ll redirect you to your Google Analytics dashboard, at the precise location where you can see the detailed report. Viewing your top sources of revenue, as well as other important reports, is super easy with MonsterInsights. However, if you haven’t installed MonsterInsights on your site, you’ll need to log into your Google Analytics account. We’ll show you how in the next section. 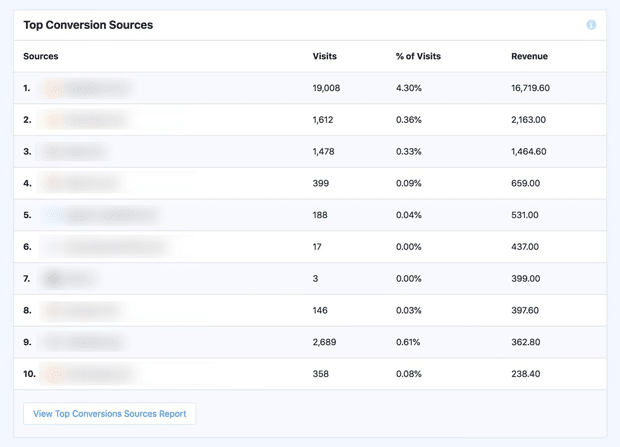 In your Google Analytics account, you can find your most profitable traffic sources report by navigating to Acquisition » All Traffic » Source/Medium. 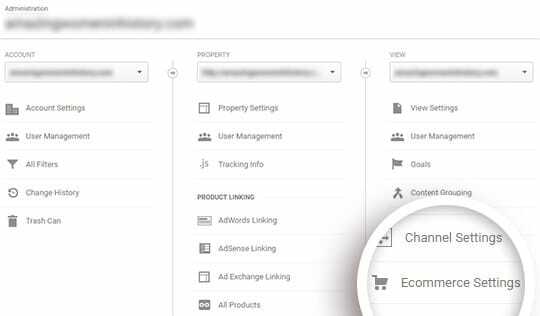 Make sure to choose Ecommerce as the Conversions type in the top right-hand corner of your report. Channels: It lets you compare the performance of different traffic channels such as social, search, paid Campaigns, etc. Treemaps: It lets you visually explore trends in your traffic channels. Referrals: It gives you a detailed report on all your referral traffic. We hope this guide helped you find the traffic sources that generate the most revenue for you.